In a chat with http://www.nollywoodgists.com, beautiful Nigerian actress, Rachael Oniga, opens up on how her failed marriage drove her into a successful career and alleged romance with younger colleague Yomi Fash Lanso. She is an easy-going person but l'm like a coin with two sides. l could be very hot and l always pray nobody sees the other side of me. l always serve God. I'm a catholic. What led you into the movie industry? I started acting in 1993, after l got seperated from my husband. Though he is late now, l told myself l wasn't going to go into the labour market because, l was a full time housewife before the seperation. For four years we tried to have babies, but they weren't coming and the doctor advice was that l should take things low. Although, before then, l was working as a programmer and l had a heavy workload in my office; Ascoline Nigeria Limited. It is a Dutch Consultant Company. After the seperation, l met Lai Ashadele and he asked me what l was doing and l said nothing. When l was in Federal School of Science, my friends used to go to NTA. We would watch them do 'Village Headmaster', so when Lai saw me, he said, "you seem to have a flare for acting, why not go into it?" and since l wasn't doing anything then and was not ready to go into the labour market, l started acting with the 'Memorial Hospital' which was my first job on TV and other jobs started coming in. You feature more in Yoruba movies than English how come and how financially rewarding is it? 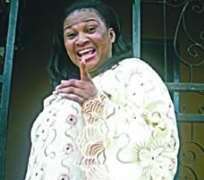 I am a crossover actress which made it easy for me to be relevant in the Yoruba movie sector because l had spent time in the English and a lot of the directors and producers in the yoruba sector kept asking me why l select jobs and that l should try doing some jobs with them. In the area of finance, l must be very sincere with you, its not as rewarding as the english sector of the industry. With them you can earn more. You know they do this brotherhood thing which is "you help me, l help you" kind of thing. If a seasoned producer is producing, he calls on me and if l'm producing mine, l call on him. So there's no question of pay off. Which movie has been the most challenging for you? Oduduwa. It was really challenging when we had to walk bare footed, expose our bodies. The same with Sango, but that is not to say some other contemporary movies have not been challenging like when l've had to act as a doctor. I always try to learn all l can about a profession so l am not found wanting. I believe in looking it, playing it, like when l was opportuned to act for Peter Igho of NTA and when l walked into the hospital in one of my scenes, even the nurses never knew l was only acting, they thought l was a doctor. So, what l'm saying is that all roles are challenging because you have to put in your best. Is any of your kids interested in acting? No, but they love music, catwalking and when l'm in the house, they just amuse me. What led to the seperation between you and your late husband? The African thing l would say. Another woman came in and before l knew it, l was out of the house. Did you leave of your own free will or you were sent packing? He is dead now. He was a man not used to quarrelling, kind and caring but all of a sudden the table just turned and it was like you have to leave the house. His family intervened but his mother was in support of me leaving. Sometimes, you have mothers-inlaw who would want to destroy their son's marriage for no just cause. She was married to someone with many wives, she is the type that does not believe in taking someone to the altar. Her real reason for trying to to seperate us was that if the man dies, and he has taken the woman to the altar, all the properties of the man belongs to her. She encouraged him. So did your husband marry you at the altar? He did not listen to her intially, but after the wedding and eight years of being together, serious pressure started coming in and l was virtually forced out of the house, because l was carried from the house to the hospital. The whole thing turned physical and as God would have it, the woman who had caused the whole problem never came into the house not even for one day. This was because after l left, another woman chased her out of the relationship too. Did you see the breakup coming? No! He was a loving man. It all happened in the space of 3months. This was a man that would tell you he is somewhere at a particular time and would true to his word. He was a management consultant. He used to come home during his break time to check on us so much that l was the one who used to chase he back to the office and he would say it's my business and all that. How many kids did you have for him? How would describe Rachael on set and Racheal in real life? No, no, no. Rachael Oniga the actress is a different person from this person infront of you. Right now, l'm my children's mother.